The National [Tune in Tuesday] – my books. my life. When I think back to my best concert experiences, The National easily jumps to the front. I saw them last fall and I think I was on a concert-high for three days. I’ve already blogged about it actually. Thanks to Ginger at Greads! for hosting Tune in Tuesday. I don’t know much about this band, but your videos today have made me curious, and now I want to add one of their albums to mt ipod and see what I think. Thanks for sharing this with me! I recommend starting with High Violet. I was waiting for this post from you 😉 Hearing them close with Vanderlyle Crybaby Geeks is in my top concert experiences, too. Such an amazing way to finish an intimate show like that. 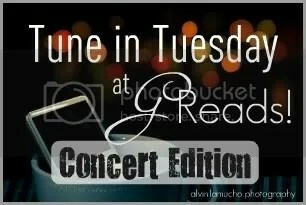 Oh they were my very first concert Tune in Tuesday. They were absolutely the highlight of this years concerts for me. I knew I wanted to see them but I wasnt expecting what I got. The week before I saw them I had seen Kings of Leon which is one of my favorite bands and I was a bit disappointed in them…let me tell you the National Show blew KOL out of the water….Loved the ending with Crybaby when they had the whole venue singing with them! Conversation 16 was the first song I ever heard from The National. Since then, I’ve been kind of collecting more of their stuff when I’m able. lol. Thanks for sharing & I’m glad you enjoyed the concert!